Lab adventures tend to be among my favorites, and I love the 400 ton lab ship from classic Traveller. Rather than create a new deck plan for an already perfectly good ship, I’ve decided to offer suggestions for creating your own lab-based game scenarios. Decide what type of gameplay you want. Who are your adventurers? Decide what type of game you want to play. Will this be a one night one-shot, a minor side quest, or the start of a new campaign? Do the players prefer combat heavy games or is exploration and heavy roleplay more their thing? Keep these in mind as you develop the scenario. I’ve added an extensive list of lab types, and some ideas, mostly movies, to draw inspiration from. Think about what type of lab it is and who works there. Is the lab well-funded, or barely getting by? Is it a large, high-tech facility or in someone's garage? Is the work being done at the lab legal/illegal, ethical/unethical, controversial/uncontroversial? Who supports the research? Who, if anyone, is opposed to it? Who mostly occupies the lab? What will their reactions toward PCs be? What is unique about the lab, if anything? Does it require zero-G rooms, clean rooms, massive computer processing, special environmental conditions, or live human subjects? Or is it just research done at a computer? With whom does the lab collaborate and why? What successes and failures has the lab had? Are there any prototypes of their work? Note: some of these may represent technologies beyond TL15. If so, the experiments should generally fail or have limited success, otherwise the technology would become the new standard. Other type of research may not be appropriate for the "feel" of a typical Traveller game, but that should be at the referees’ discretion. There may be some cross-over in lab types. A lab doing cloning research may involve animal subjects. Try picking two and see how they mix. Think of a plot based on your gaming preferences. If you are stuck coming up with a plot consider using something like S. John Ross' The Big List of RPG Plots or Georges Polti's 36 Dramatic Situations. I personally like The Big List because it is specifically geared toward RPGs. Use your imagination to fill in the gaps. Try to anticipate what a player’s reaction might be to your set up and then assume they are not going to react that way and come up with something else. Feel free to change or ignore previous decisions you've made. Additional NPCs as may be needed: various scientists, company employees, and the bad guys. The PCs are contacted by Kepp Maddix, a relatively low-level procurement clerk at Progressive Integrated (PI), to do a supply run to one of their remote research facilities. The supplies are nothing out of the ordinary; a few new computers, a couple office chairs, some medical supplies, about four dtons in total. The job will pay slightly more than normal because of the remoteness of the site and because the regular delivery service cancelled at the last minute. Delivery of the medical supplies may be time-sensitive, so the PCs may have some room to negotiate their fee. The delivery site is an asteroid field in-system, about one day away. If needed, the referee can determine the asteroids distance from the main world based on the capabilities of their ship and the Typical Travel Times table from Book 2. If the PCs do not have their own ship, they may be hired to pilot the company's small cargo ship (100 ton, 2-G). If the PCs research the company before accepting the job, they will find it is a smallish, fairly generic research company reaching into a variety of markets, mostly humanitarian (genetic crop enhancement, vaccines, disease research). Maddix will not be able to disclose, or does not know the nature of the research being performed at the facility. 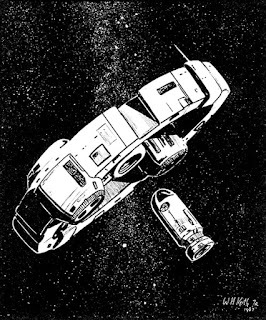 The PCs accept the job, pick up the cargo, and fly out to the asteroid. As they approach the asteroid they see a starship leaving the area. They announce their arrival to the base, but no one responds. They land and soon discover the facility has been recently attacked. The facility appears to have been ransacked, as if someone was looking for something. The facility’s 23 employees and scientists may be killed, rendered unconscious, and/or locked up, depending upon the referee’s desires, but some of the scientists should be alive. If the PCs think to contact Maddix, he will put them in touch with the head of the company, Linn Hebron. If not, then a scientist will immediately contact Hebron to make her aware that sensitive research and contagious viral samples have been stolen. Regardless of who makes contact, Hebron will offer the PCs a reward for return the stolen goods, since they have the only ship in the area. The reward will be substantially more if the PCs can keep the incident quiet. Kern Hilson, one of the scientists, will offer to accompany the PCs to reclaim the goods. If the PC group is undersized, some additional scientist may offer to come along as well, and some may even have small weapons. The lab is located on a small, remote asteroid. There is a small landing pad and single above ground building. The facility is mostly underground. The lab is doing viral research, which includes animal testing. The lab does not have a security force, but rather uses secrecy and its remote location as protection. There are no other spacecraft at the facility, but it does have a good communication system which will allow instantaneous contact with the planet. The research is being done to produce vaccines against future outbreaks (humanitarian reasons). The scientists and company are the good guys. The research being done is apparently for humanitarian reasons, but the owner of the company has other plans for it. The scientists are dupes at the mercy of corporate greed. The scientists are intentionally trying to create a weaponized virus. The scientists and the company are the bad guys. Some or all of the scientists are doing the research against their will (under threat to their families or some such), in which case the facility has a small security force to keep them in line. The scientists are the good guys and the company is the really bad guys. Note: the PCs don’t necessarily need to know this to have a successful adventure, but it might come out in game play and affect how the NPCs react. The ship departing from the asteroid at the time of the PC's arrival contains the stolen research and virus samples. The bad guys’ ship has the same acceleration as the PCs ship. The idea is that the PCs are basically right behind the bad guys the whole time, whether the bad guys know it or not. The bad guys jump to another system, which can start an entire adventure of tracking down the bad guys. The bad guys make it to the planet (or starport) ahead of the PCs, but just barely. There can be a possible shoot-out on the landing pad, or maybe the bad guys escape. At any time the PCs can attempt to call the local police forces or nearby ships for help. This may prevent the escape of the bad guys, but the PCs would not get their reward. *If you want to have consequences for failure, the bad guys can discover they are being pursued in space, and initiate combat. The bad guys are terrorists, ideologically motivated, out to take good science and use it for bad. The bad guys are financially motivated, looking to sell the virus to the highest bidder. The bad guys are a group of radicals who understand the dangers of the research, for good or bad, and want to keep it out of the wrong hands. The scenario end game and conditions of success are up to the referee and players. Note: The "Better Late Than Never" plot kind of takes the adventure portion of this scenario out of the lab, but I just decided to roll with it. An alternative scenario might involve the PCs being at the lab just before the bad guys attack, or they might arrive during the attack. These are a lot of good suggestions. If I get some time, I will turn them into a "generate a random lab encounter" procedure.